Hi, I’m Renee, and I’m a former slacker. For the last few years I haven’t even bothered at the idea of setting a New Years resolution. Now, I set new goals with each day. It has taken me years to finally get comfortable with setting goals, and it’s a real shame because it is such a simple thing to do. 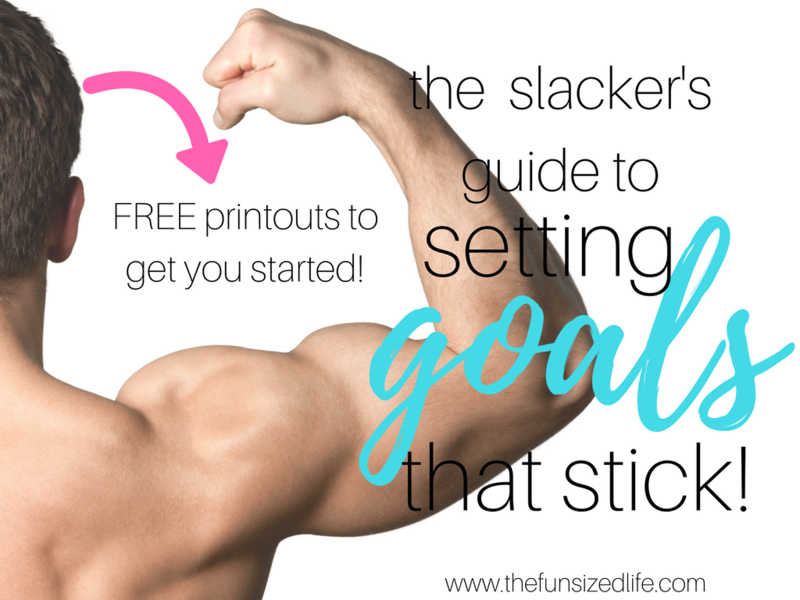 Below I have laid out how to set easy goals that stick as well as some printouts to help you succeed and keep track. Before ever starting a goal, asking yourself, “What’s my ‘why’?” Why is this goal something you have set for yourself in the first place? Where did the desire for it come from? Taking the time to get clear about what your intentions are will help you keep your head in the game. Personally, I feel the need to write down my intentions, or my “why” somewhere where I can see it and remember it every day. This year I started writing things on my bathroom mirror with dry erase marker. That way, every single time I look in the mirror I am reminded of those goals I want to accomplish for myself and why. 2. Do not set a big goal. This might sound totally crazy and that’s because people usually set big goals they want to accomplish. That’s great, dream big! The thing is, if you look at the big picture and what it will take to get you there, it’s super easy to feel instantly overwhelmed. One of my favorite inspirational speakers and spiritual author, Wayne Dyer, once said about his 20 years of sobriety that if someone had told him to try going 20 years without drinking the first thing he would want to do is drink. Isn’t this such a true thing? The second you decide you want to lose 50 pounds is the same second you decide you want to eat an entire cake by yourself. This is why small, tangible goals are the best ones to start with. You may ideally want to drop 50 pounds, but that’s a lot of pressure to put on yourself right off the bat. Plus, the more reasonable a goal seems the more likely you are to have faith in yourself to obtain it. I have created an easy guide printout to help you get clear about your small goals so that you can slowly turn them into bigger goals. Monthly Strategy: Keep track of distance of daily walks. Using these printouts to help you keep track of your goals will help you hold yourself accountable. In fact, you are 42% more likely to succeed in your goals if you take the time to write them down. There is a great article that breaks down the science of writing down goals that you should definitely look over, The Power of Writing Down Your Goals. This article also points out the importance of setting goals in all important areas of your life; like relationships, money, health and love. So often we take the time to set goals or new years resolutions and we easily overlook those areas of our life that are most important. To continue focusing on your health setting goals, I have an additional printout to help you easily keep track of your daily goals. It is easily laid out so you can write down the amount of fruits and vegetables you eat each day. On top of that, I have added water drops so for each glass of water you drink, you can cross it off to keep track. Lastly, there are weights to cross off your movement goals whether that be a 30 minute walk, fitness class or even time in the garden. The simpler you can keep it, the better. The major thing to remember with goals is to always keep it simple. I hope these printouts can help you keep on the right track. If you are looking for a little more organization and ways to stay on track, don’t miss my entire printout library! Great post, Renee. Simple, practical advice for us to take into the new year!